One credit is given for every hour of participation. Here at Rhydypenau we come under the Cardiff scheme and any activity undertaken in the lunch hour or after school, which has been arranged through school, is credited to the child's account. Credits are also awarded for participation in residential trips. You can also register any other activities your child participates in by completing the parent form and returning it direct to the Children's University Co-ordinator for Cardiff, Mrs Rebecca Brockway at County Hall. These can include sporting clubs, uniformed organisations, private music lessons, etc. Bronze, Silver and Gold certificates and special prizes are awarded annually. 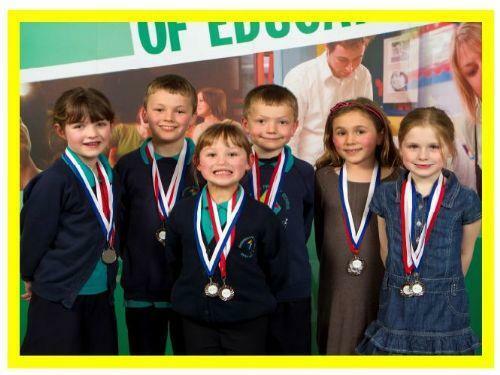 The picture above shows Rhydypenau children receiving their awards at a special ceremony which is usually held in the spring term at UWIC, Western Avenue Campus. NB Mrs Brockway is currently on maternity leave. As a result, this year's ceremony has been cancelled and will be held in conjunction with the 2014 ceremony at a date to be arranged. Use this form to record your child's out of school activities for Children's University Credits. You do not need to register school clubs.